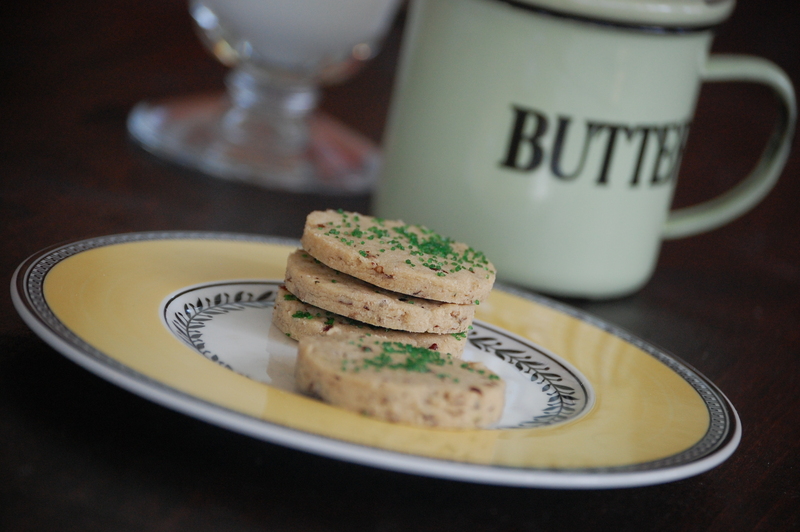 On the Fifth Day of Christmas Cookies….I was running short on sugar. Decided to go down the savory road- these are still a little sweet, but a great alternative for the strange people that don’t enjoy sweets! The rosemary is great for holiday parties! Martha Stewart has some magical recipes, and they are always perfectly written and tested. I know that half of a cup means half of a cup with her recipes! 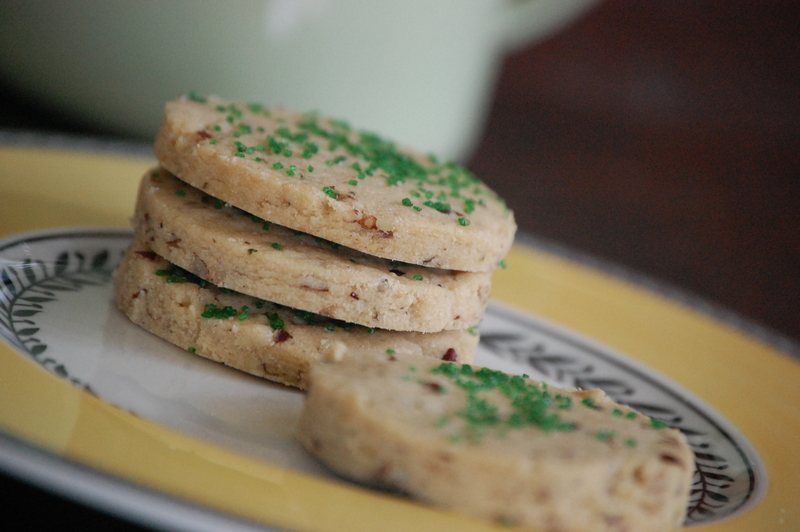 These cookies are delicious on their own, but serve them with a bit of blue cheese to them and you will never forget them! 1. Preheat oven to 300 degrees. Whisk flour, nuts, rosemary, and salt in a large bowl. 2. Put butter and sugars into the bowl of an electric mixer fitted with the paddle attachment. Mix on medium speed until lightened, about 3 minutes. Mix in vanilla. Reduce speed to low. Add flour mixture; mix until dough comes together and is smooth, about 3 minutes. 3. Turn out dough onto parchment paper, and pat into a round. Place parchment paper on top; roll into a 12-inch round, 1/4 inch thick. Transfer to a baking sheet; refrigerate until firm, about 30 minutes. 4. Cut out cookies using various sizes of heart-shape cutters (1/2 inch to 3 inches); transfer to parchment-lined baking sheets. (Keep same-size cookies on same sheet.) Roll scraps; cut out. Gently press raw sugar onto edges of cookies. 5. Bake until just golden, 15 to 18 minutes. Let cool on sheets on wire racks. Cookies can be stored in an airtight container at room temperature up to 5 days. Add a hunk of good blue cheese and savor it! Take these and a wheel of blue cheese to a holiday party! Woot! 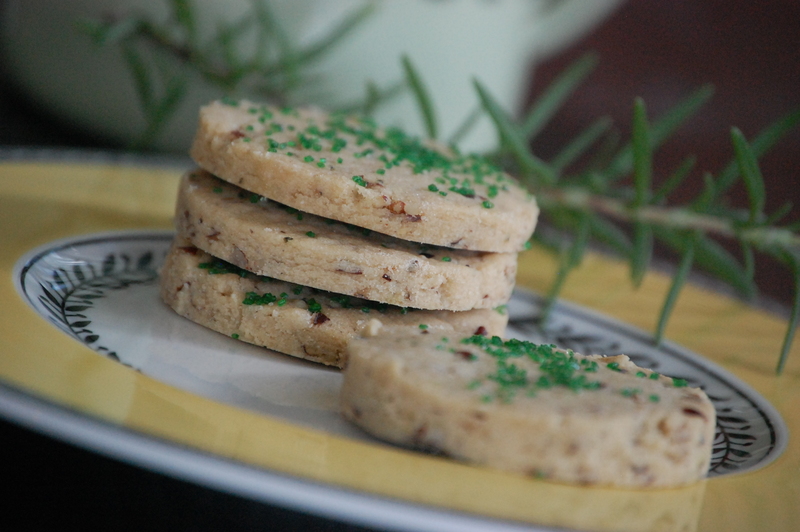 This entry was posted in Christmas, Cookies, Holidays, Recipes and tagged 12 Days of Christmas Cookies, Blue Cheese Cookies, Rosemary Walnut Shortbread Cookies. Bookmark the permalink. You know that Mum Mum’s shortbread is the best! i love the flavor combo in these cookies.. they sounds pretty amazing! definately drool worthy. thank you for sharing this and have a great weekend.